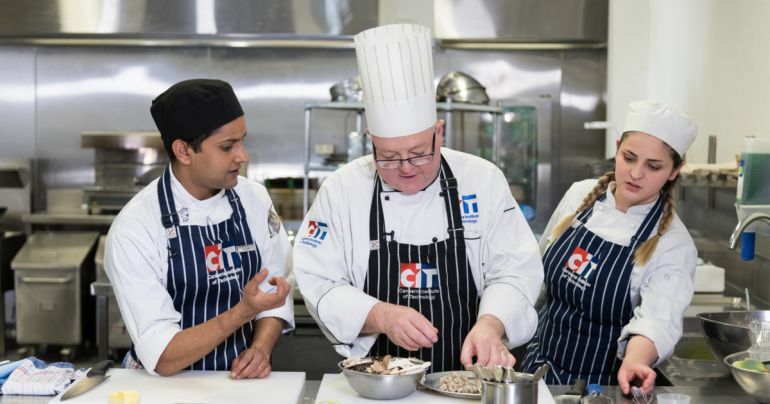 CIT apprentice chefs are turning up the heat in Pressure Cooker - a brand new four-part reality cooking show launched this week featuring local talent and fresh Canberra Region produce. Pressure Cooker is an exciting collaboration produced by and featuring CIT students. Students from media production, music, sound production, culinary, graphic design, CIT Yurauna, ICT, fashion, photography, hair and beauty, carpentry, hospitality and the CIT Student Association were involved in the making. The series features emerging CIT chefs creating restaurant-quality dishes as they battle it out in a cutthroat competition to see which team will win. The show draws on CIT's links with industry with judges from local restaurants and fresh local produce from the Capital Region Farmers Market. Local comedian Chris Endrey hosts the show and introduces featured judges from iconic Canberra eateries including Akiba, Pilot, Lanterne Rooms and Canberra Southern Cross Club. Pressure Cooker was the brainchild of CIT Screen and Media Teacher Nunzio Gambale. With years of film and media industry experience under his belt, Nunzio wanted to make the training experience as real as possible. Nunzio said deep understanding of communication and collaboration is at the heart of storytelling. "I wanted to disrupt the classroom environment and create a workplace environment where they relied on each other to complete a very complex set of tasks over a long period of time. This created a dynamic working relationship between the students, the partners, the internal and external clients to achieve outcomes just like it really is in the industry," Nunzio said. "Pressure Cooker simulates a real-life production experience and students really engaged in the process working on stories and content outside of their comfort zone and shaping it into a completed, collaborative piece of work." Head Judge and Culinary Skills Acting Head of Department Shellie Flat said "Pressure Cooker is a celebration of vocational education and proves our students are central to the thriving food industry in Canberra." Tune in to see who will be crowned the champions. Episode one of Pressure Cooker is now live at www.citpressurecooker.com and on CIT’s YouTube channel.